Celebrate the winter solstice and its warm traditions with a concert of acoustic music drawn from the multi-platinum selling Winter Solstice series as well as their many solo releases. Windham Hill founder and Grammy-winning guitarist, Will Ackerman, and Grammy Award-nominated singer, fiddler, pianist, and songwriter Barbara Higbie, Grammy-nominated guitarist, composer Alex de Grassi and supporting musician, bassist Todd Boston, and cellist Ellen Sanders, come together to lead this joyous holiday concert. William Ackerman founded Windham Hill Records in Palo Alto in 1975. The label’s audiophile recordings were a run-away success with critics and audiences alike. Musicians including Michael Hedges, George Winston, Will Ackerman, Alex de Grassi, Barbara Higbie and Darol Anger and their group Montreux, Liz Story, Mark Isham, and Tuck and Patty quickly became internationally recognized. The name “Windham Hill” became synonymous with the best in acoustic music in the 1980s and 90s. Windham Hill’s 10 Winter Solstice compilation recordings, selling in the many millions, “changed people’s conceptions of seasonal music” (John Diliberto, Echoes radio show host). 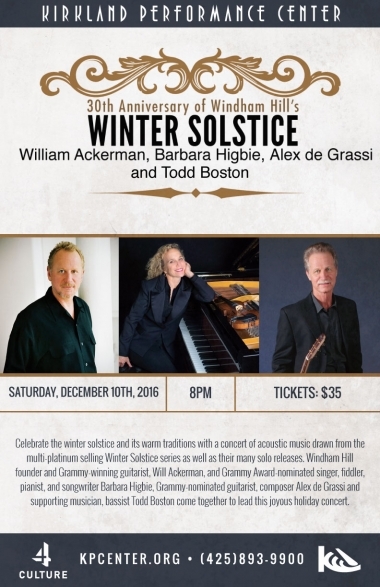 The Winter Solstice Concerts bring the music of Windham Hill full circle, 40 years after it was originally conceived on the Stanford campus.